Sometimes there is nowhere to go but up. How high you go? That all depends on the people involved. Such is, or at least was, the case with the Annabelle franchise, the first spin-off from The Conjuring universe. The first movie was a pretty big let down for many and at best was an okay run-of-the-mill horror movie with a creepy doll. Annabelle: Creation has officially obliterated any and all expectations, delivering a sequel that is worthy of The Conjuring universe. Terrifying and fun, this movie is going to catch a lot of people by surprise. The New Line Cinema movie Annabelle: Creation centers on a former toy maker named Sam Mullins (Anthony LaPaglia) and his wife Esther (Miranda Otto), who are happy to welcome a nun and six orphaned girls into their California farmhouse. Years earlier, the couple lost their 7-year-old daughter, whom they affectionately refer to as Bee, in a tragic car accident. Terror soon befalls the group when one of the girls named Janice (Talitha Bateman), who has difficulties walking after suffering from Polio, finds a seemingly innocent doll that actually has a life of its own. Horrifying happenings ensue. The first Annabelle seemed like a reasonably good idea. Take one of the terrifying relics from The Conjuring universe and center a movie on it. These things all have stories. Why not? The problem is that the movie was simply forgettable. It wound up feeling like more of a cash grab than anything. Given that The Conjuring is one of the most highly-regarded horror movies of recent memory, it felt more than a little unfortunate that the first spin-off was so average. Annabelle: Creation is anything but average and is far from a cash grab. It is everything we all wanted the first Annabelle to be and more. The devil is in the details with these things and director David F. Sandberg (Lights Out) understands those details. Give us some characters to emotionally anchor ourselves to. Set up some nice little nuggets that will pay dividends later. Take some risks. As hard as it may be in the horror genre these days, try some creative and unique things. 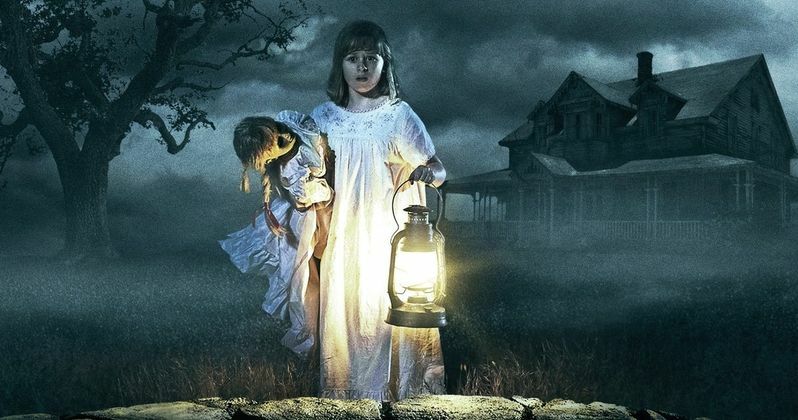 All of that is accomplished in Annabelle: Creation but, most importantly, this movie does not rely on cheap jump scares. Instead, Sandberg continually ratchets up tension in a way that is almost maddening yet delightful where the viewer is just begging for a loud, flashy release that sometimes never comes. It is incredibly effective. As studios seem to be learning, horror movies can make money if you just churn out some simple scary garbage. But horror movies can make a ridiculous amount of money if you pay a little more attention to quality. This is infinitely better for the viewer. Good acting is not just a luxury. It is necessary. Quality sets, costumes and shots will not go unnoticed. Many small details add up to make a huge difference. Annabelle and Annabelle: Creation represent both sides of this coin. The jump in quality from the predecessor to the sequel is so enormous, it is hard to even think of them as part of the same whole. It would be like if the first ever Star Wars movie that was released was The Phantom Menace and then the next one that was released was the original Star Wars. It is that significant. Every studio in Hollywood is currently trying to build some kind of cinematic universe. After seeing Annabelle: Creation, it is clear that New Line has figured out how to handle The Conjuring cinematic universe. They made a mistake and they aren't going to make it again. They had their mulligan. This sequel provides just the tiniest breadcrumbs of things to come without getting in the way of the movie at hand. It stands on its own but provides more for those who want it. Make no mistake horror fans, this is grade A, big studio horror at its finest. Unless you flat-out hate supernatural horror movies, I simply can't imagine anyone willing to go see a horror movie not having a great time with Annabelle: Creation.